PTZ Controller is PTZ keyboard simulator. It is virtual keyboard to control high speed Pan Tilt Zoom camera. PTZ Controller controls PTZ camera through RS232 port directly, or through RS485, RS422, USB port with a converter. PTZ Controller supports protocols for Pelco, AD ASCII, AD Machaester, Bosch, Sony, Panasonic, Samsung, LG and Canon. PTZ Controller supports sending user-defined Hex data to PTZ cameras. PTZ Controller supports auto scan that includes preset scan and auto pan. PTZ Controller supports keyboard shortcuts for 255 camera addresses and 127 presets. PTZ Controller supports export and import setting file. PTZ Controller supports plug-in for game joystick and ptz joystick from v2.8. 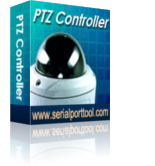 PTZ Controller detects all available serial port automatically. PTZ Controller is a good debug tool for test and install PTZ camera. It is more powerful than traditional PTZ keyboard hardware. It's totally free to try full function within 30 days! Please download to try it now! It includes all functions of PTZ Controller. It is written in C# by VS2005. It supports .net Framework 2.0.